I recommend starting your feast with a sampler of Russian salads, which may vary day to day such as Vesna (cranberries,carrots and cabbage,) eggplant, potato, carrot, and Vesna (cranberries, carrots cabbage, lemon),and Vinegrat with beets. Of course, no Russian meal would be complete with borscht, beet soup, available in beef or vegetarian versions served with a dollop of sour cream. Black bread with an herb spread comes with every meal. Among my favorite entrees are Chakhobilli, a George-style chicken casserole simmered with onions, tomatoes, basil, mint and other herbs/spices, chicken Tabaka – actually a Cornish game hen fried to a reddish brown, and Golubtzi—stuffed cabbage rolls filled with ground beef, rice, carrots tomato sauce, onions and sour cream or yogurt on the side. Every dish is tender, tasty, and served up in heart portions. Other options include strogonaffs, meat cutlets, kebabs, and Chicken Kiev. Desserts include baked apples which are delicious but it’s impossible to top the walnut honey cake, baked from the owner’s grandmother’s recipe. Enjoy it with a cup of tea to top off your meal. 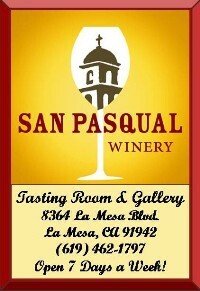 Bring friends to share dishes if you wish for a memorable dinner; there are also very affordable lunch specials. Do I heartily recommend Village House Kalina? Da! 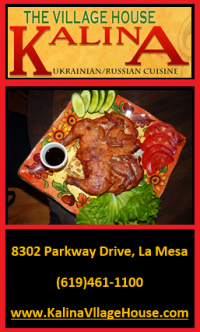 You see, La Mesa is winning, they feed the folks good Russian food. Meanwhile in El Cajon, the mayor has the police arresting and/or citing good citizens who feed the homeless. What a contrast!